Dario Acosta is a portrait photographer whose work can be seen in various Advertisements, Magazines and Cd Covers across the country. 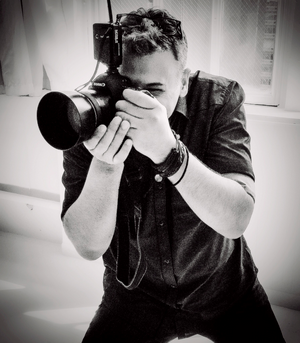 His studio is located in Chelsea NYC and he travels Nationwide and Worldwide for major advertisers and corporations. A graduate of The School Of Visual Arts he has been shooting Celebrity, Ceo’s and “real” people for the past 15 yrs. His Corporate clients demand the upmost quality in shoots that sometimes last only 5 minutes, Editorial clients come back to him time and time again for consistant, timeless portraits. The past 15 years he has focused his attention on compiling one of the largest single person bodies of work on Latino role models in the United States. He has photographed many legends that are no longer with us such as Celia Cruz, Tito Puente and Anthony Quinn, as well as living legends like “Cachao” and “Candido”. He has worked with some of Hollywoods greatest talents, Olympic Athletes and countless Musicians, Writers and Educators. For the past 12 years he has also been traveling the world photographing the worlds top Opera singers, conductors, composers, designers and individuals responsible for the production of the worlds most beautiful performances.